Justin Bunting is currently pursuing a Doctor of Musical Arts degree and is a Graduate Teaching Assistant in the percussion area at The University of North Carolina at Greensboro. He earned a Master of Music in Percussion Performance from Belmont University and a Bachelor of Music in Percussion Performance from The Ohio State University. Justin has appeared at PAS Days of Percussion in North Carolina, Tennessee, and Ohio and performed in a showcase concert at PASIC and the Midwest Band and Orchestra Clinic in 2005 as a member of the Ohio State Percussion Ensemble, as well as internationally at the Toronto Summer Music Academy and Workshop with members of the percussion group Nexus. 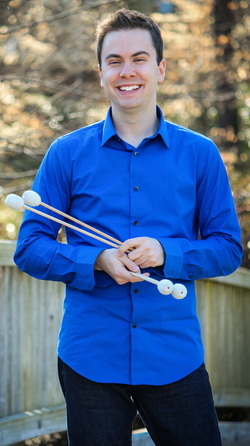 He has performed with the Nashville Philharmonic Orchestra, Greensboro and Winston-Salem Symphony Orchestras, Winston-Salem, Greensboro Opera, and as featured marimba soloist with the Belmont University Symphony Orchestra. Justin has studied with Dr. Neeraj Mehta, Dr. Kristopher Keeton, Dr. Christopher Norton, Dr. Susan Powell, Joseph Krygier, Chester Thompson, and Todd London.